The 2011 Mustang has a sporty look that remains very distinguished, especially because of the front fascia. Compliment your Mustang's aggressive front end with a Chin Spoiler. This component blends with the natural lines of the lower fascia, creating an intimidating appearance that retains a fresh, factory look. 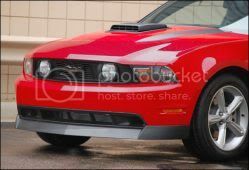 This chin spoiler also brings the Mustang closer to the road which greatly improves the vehicle's stance.